© Wendy Runyon of Musings of a Bookish Kitty 2006-2009 If you're reading this on a site other than Musings of a Bookish Kitty or Wendy's feed, be aware that this post has been stolen and is used without permission. Makes you want to drive for hours. Makes me think...hum..makes me thinkg..What is the destination? I love your road trips! I'm thinking you wouldn't even need a destination with this scenery! Beautiful road. Looks like a great place to ride the motorcycle! So pretty! What a clear and beautiful day to be out on the open road. I adore highway shots. It really gives the viewer a feeling of movement. We'll be *hopefully* headed up to Yellowstone soon, so I'm guessing we'll see a lot of scenery just like this. 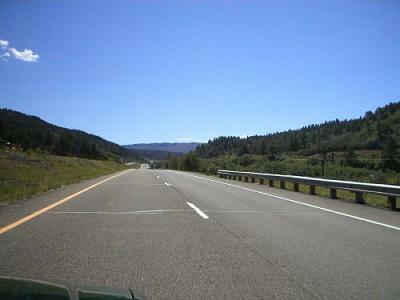 I've always loved driving through Colorado. I soooo want to go back to Colorado now! 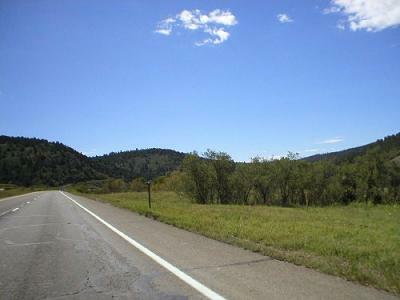 My husband and I used to take our bicycles out on the mountain highways there and ride for hours. It was quite a workout, and the best part was that on the days I rode I could eat anything I wanted! The blue sky is so pretty, Wendy! Thank you everyone! We had such a fun time on that road trip. I hope we'll be able to do it again someday.